Healthy, sustainable food not only nourishes your body, your community, and the planet; it tastes better, too. 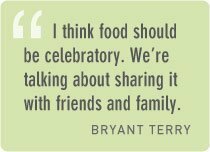 Bryant Terry discusses his work as a chef and educator introducing people to the pleasure of eating well. What excites you most about food? Bryant Terry: What excites me about food is eating. Because of my family, I’ve always been around good food, and I’ve always cooked delicious food. I learned from my grandmother, so I had a great teacher. But there was this moment when I realized the transformative power of cooking food and helping people think differently about food issues. I realized that I wanted to be invested in the politics of food and educating people about these issues not only in a heady, cerebral way. 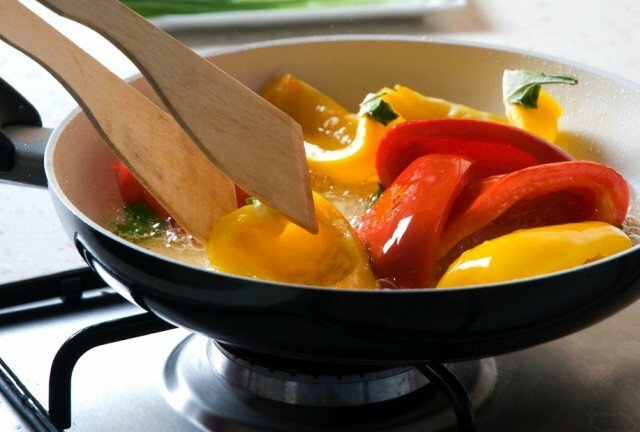 I wanted to also have the skills to prepare delicious meals and to teach other people how to prepare meals for themselves and their families, so that they could have that connection and bring everything full circle. How do you get people excited about good food? Bryant Terry: The way that I’ve connected with most people is on a purely visceral level, by providing them with fresh, local, sustainably produced, organic food, and giving them the experience of a delicious meal. Many people associate the type of food we’re talking about as being bland and tasteless. One of my goals is to help people move past that stereotype. When you’re getting food from within 100 miles, after it’s been freshly picked that morning, it’s much more flavorful than something that’s been sprayed with chemical pesticides, shipped across the globe, or sits in a warehouse for a couple weeks. Food is such a personal thing. It’s one of the most primal desires that we all have. A lot of people take what they eat, their cultural and familial food ways, very seriously. I like to hit people where it matters the most, and that’s the stomach. When you get people excited in that way, you can introduce new ideas and get them thinking about supporting different producers. But it starts with the stomach. Because cooking is central to the work that I’m doing now, I get a chance to share those skills with a lot of people. One thing I enjoy about bringing friends and family together to eat is being in the kitchen and cooking with them. 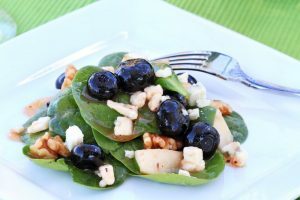 Once people are chopping up fruits and vegetables, sautéing things, and being a part of that preparation process, it makes them a little less hesitant to do it themselves. What’s does “grub” mean to you? Bryant Terry: “Grub,” as my co-author, Anna Lappé, and I describe it in our cookbook, is healthy, local, sustainably produced, organic produce that takes into consideration workers’ rights. We like the terms ”organic” and “sustainable,” but they just deal with the quality of the food. We wanted a term that talked about things that are bigger than that. ”Grub” encapsulates values, flavor, and all those other things. I think food should be celebratory. When we talk about grub, we talk about grub parties. We’re not just talking about getting food and coming home and eating it alone. We’re talking about sharing it with friends and family, and using celebration to help push food advocacy to the next level.